I hope everyone is having a wonderful holiday break! When you get sick of all that leftover ham (delicious in its own right, but how many ham sandwiches in a row can a person eat, really? 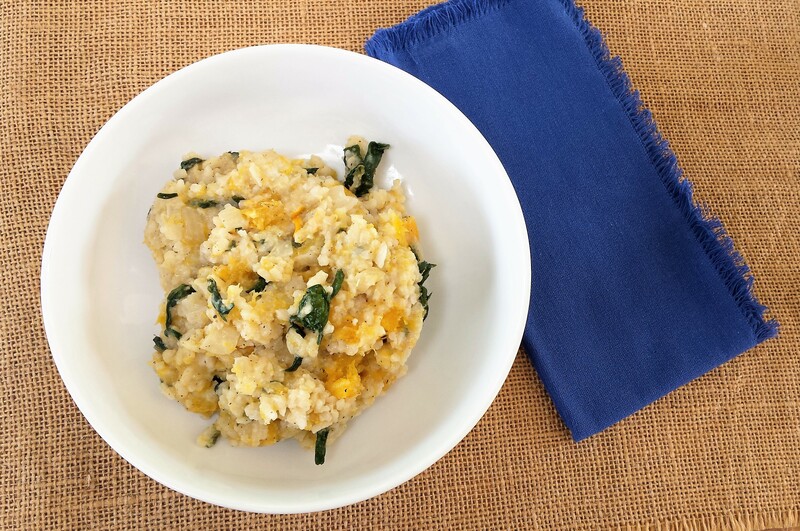 ), make this creamy, decadent acorn squash and spinach risotto. It’s easy and delicious and probably takes less effort than forcing yourself out of your jammies to go get carryout would. Nixing the cheese (or subbing a non-dairy cheese) and using vegetable stock makes this a great vegan option, as well. Preheat the oven to 400 degrees. Slice the acorn squash in half lengthwise and scoop out the seeds. Place chunks of butter into the cavity of each half, then season lightly with salt and pepper. Let roast, cut-side-up, for 45-60 minutes, or until the flesh is soft when pierced with a fork. Remove from oven and let cool. Add the grapeseed oil, onion, and garlic to a large pot over medium heat; let cook for about four minutes, until onion is translucent. Stir in the rice and let it toast for a minute or two before adding the white wine (here’s the time to pour yourself a glass, as well!). Once the white wine has evaporated after a few minutes, begin the process of adding in the stock. About every five minutes, add a ladleful of stock to the rice, allowing it to absorb fully before adding the next one. This process should take about 35-45 minutes. A note here: the key to a good risotto is definitely being intentional and keeping a constant eye on it. Add too much stock at once, and the rice is boiling in liquid; add too little too infrequently, or stir too infrequently, and the rice starts to majorly stick to the pan. Stirring too much is also considered a bad thing, so I try to only do it right before I add my next cup of stock, though I usually can’t resist getting in there more frequently than that. If you find the rice is really sticking to the bottom of the pan or is absorbing the stock too quickly, try decreasing the heat. Above all, use your wonderful cook’s intuition, and you’ll be just fine! Once all of the stock is gone and has been fully absorbed by the rice, you should be left with a risotto of a wonderfully creamy consistency. Stir in the Parmesan cheese and then the spinach. Scoop the cooled acorn squash flesh out of each half and dice it up into chunks; fold 1 1/2 cups of it into the risotto. Add the dried sage and season with salt and pepper to taste, then serve immediately. Yum! Makes about four generous servings. This looks scrumptious and very healthy!